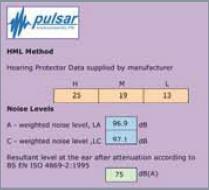 All hearing protection (PPE) should be supplied by the manufacturer with attenuation (reduction) values for each of the H, M and L values. By knowing the 'C' and 'A'weighted Leq values and the difference between them you can use either a spreadsheet or simple formula to prescribe suitable hearing protection for your workforce. By just pressing the C-A button, the instrument will automatically switch to 'C-A' Measurement Mode. A blue LED indicator shows that you are now measuring in 'C-A' mode rather than the normal 'Broadband' mode. The instrument will make an Leq measurement with dB(C) Weighting (LCeq) and will continue until the average level has settled. When the level has settled, the instrument will switch to dB(A) and repeat the process with 'A' weighting. When this level has also settled, the instrument will display the LCeq, LAeq and in large digits, the resultant LCeq-LAeq value on the screen. Making this type of measurement has never been easier as everything is done in an automatic cycle for you.